Do you remember my discussion of cruising myths back in November? I thought I'd revisit Myth #2: "I will be bored on a cruise" and offer another idea to make sure you aren't bored during your cruise. Many of you put up Christmas trees in your homes and /or offices. Where did the ornaments come from? Do they have special meaning to you? Do they bring back fond memories? Do they tell a story of places you have been? Do you follow a theme for your tree decorations? Would you like your tree decorations to tell a story, follow a theme, or bring back memories? Do you know someone else that might enjoy an ornament from your cruise (maybe a new-born baby in your family, a client, a friend, a relative)? Your answers to these questions may be the basis for starting a collection while on your next cruise vacation or perhaps adding to an existing collection. 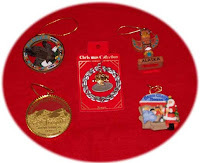 The picture here shows a few ornaments that we purchased while on past cruises. We collected an ornament from each port we visited. You have several options when starting an ornament collection. Most ships have a selection of various ornaments in the gift shops onboard. You'll usually find a selection of "logo" items including ornaments in the shape of the ship. They may also include ornaments for the various ports of call. When you are on shore, you can purchase ornaments from various locations. Often, you'll find a Christmas store in town. You may even find some hand-made ornaments that some local vendor has on display. A little pre-planning will help your shopping experience. Decide what type of ornaments you want to search for before your first purchase. Ideally you'll want to be able to add to your collection on future cruises so that you can continue to enjoy your new project. A lot will depend on where you are starting from also. If you already have a "vacation destination" theme started (it doesn't have to be cruises only) you could either add a ship ornament or an ornament from each port. If you currently have Disney ornaments on your tree, you could look for Disney ornaments in each port. A collection, such as this, gives you a purpose for your shopping excursions during the cruise. Later, when you display the ornanments, you'll recall the cruise (perhaps remembering the places you went, the people you met, even when and where you made your purchase). 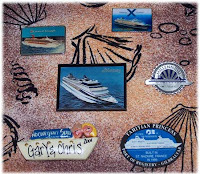 Building a collection of destination or ship magnets is another easily achievable possibility while cruising the high seas. 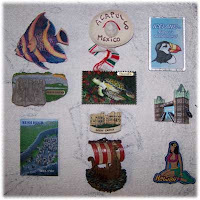 Shown here are two collections - magnets from each port and magnets from ships we've been on. I've written an article about collecting magnets on my website. You can read the entire story there. There are many other ideas for collections from ship / ports of call including: spoons, thimbles, keychains, shot glasses, postage stamps, pens, plates, coffee mugs. The possibilities are endless. Your mission, should you wish to accept it, is to pick a collectible item and either start or add to a collection during your next cruise. Keep the memory of your cruise alive by building a collection that whenever you view it, you'll bring back those fond memories. Feel free to comment about your collections. Holiday greetings to all on this Christmas Day. I hope this day finds you surrounded by family and friends. For the men and women serving our country, a special holiday greeting - may the peace of Christmas stay with you now and until you are safely home again. Thank you for your service. The military aren't the only people that are away from family this holiday season. You may not even consider this when you are having a good time on a ship, but the people that make your cruise so enjoyable are away from friends and families 6 months on average. If you happen to be reading this while onboard a ship, make sure to wish the crew a happy holiday also. Celebrating the holidays onboard a cruise ship is a great way to get together with your family and friends. I suspect you won't have a white Christmas, but I'm sure the decorations onboard will get you in the festive spirit. If you are considering this for next year, my advice is to plan early since many people have the same idea and prime space tends to sell out quickly. I hope you enjoy reading about my cruise experiences. That's my gift to you. One of the ports we visited on our 14 Night Scandinavia / Russia Cruise on Celebrity Constellation was Warnemunde, Germany. We booked a private tour with Berlin Sightseeing with three other people from our Cruise Critic group. 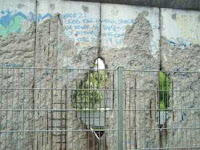 Our plans originally included taking the Celebrity "Berlin - a 20th Century Experience" tour with a train to Berlin and sightseeing once we arrived there. We had also considered doing this on our own, but due to the construction port advisory, we decided to take an organized tour. When we arrived in Warnemunde, it began to rain. Around 7:30 AM. our driver met us by the exit of the port terminal. We got into the Merecdes van without getting wet. Off we went on our 2.5 hour ride to Berlin. We met our guide, Klaus, next to the Charlottenburg Palace at 10 AM. which you can see in this photo. For more photos, see this album. After a photo stop, we were on our way to the Olympic Stadium , one of the sights of the 2006 FIFA World Cup. 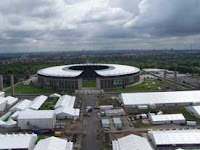 As you can see from this photo, taken from the tower which provides this aerial view, there was lots of activity as preparation was being made for the games to begin. Click here for more Olympic Statdium photos. 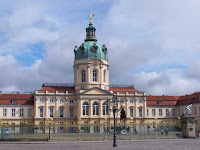 Other sites that we visited included Brandenburg Gate , Checkpoint Charlie , Berlin Cathedral and Museum Island . Read Berlin Tour Description for more details about our Berlin tour. We had free time in Berlin and went to KaDeWe (Kaufhaus des Westens) Department Store where we had a fantistic meal in the food court. The entire town was tranformed for the World Cup. 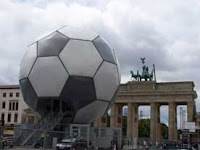 Notice the large soccer ball in front of Brandenburg Gate for example. 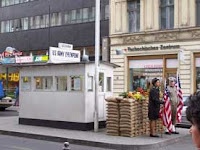 No trip to Berlin would be complete with the stops we made at Checkpoint Charlie and the Berlin Wall. Just like during our Normandy trip, our tour to Berlin brought history to life. I've often heard people debate about going to Berlin from cruise ports s uch as Warnemunde or Rostock. I believe it was worth the 2.5 hour drive from port to Berlin proper. The choice of how to get to Berlin is yours. I would recommend checking things like construction before you make a decision about venturing out on your own. We had plenty of time between the end of our tour and the actual departure from port at 9:30 PM, so we were comfortable taking a private tour. If you are worried about missing the ship, then I'd advise taking one of the ship's tours instead. But no matter which way you go, I do believe you should include Berlin in your itinerary if your plans take you to this area of Germany. For more pictures from Germany and the rest of this cruise, see our Photo Album page. We conclude our Normandy visit with three destinations: St. Mere Eglise, Pointe du Hoc, and Honfluer. St Mere Eglise was occupied by the Germans on June 18th 1940, and liberated by the Americans on June 6, 1944 (D-Day). 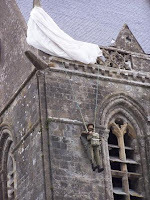 As we drove into this quaint little French town, we saw the church where the paratrooper John Steel hung from the steeple after his chute got snagged. He was captured by the Germans after hanging there for a couple hours and then later freed by the Americans. Today you can see an effigy of this famous paratrooper. 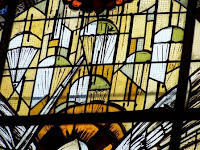 Inside the church there are two beautiful stained glass windows. One shows the Virgin Mary surrounded by paratroopers and the other shows St. Michael (patron saint of the paratroopers). A portion of the window is shown here. Across from the church is the airborne museum which marks the site of a house that caught fire during the battle on D-Day. View more pictures from our St. Mere Eglise visit. Pointe du Hoc is a clifftop location built by the Germans on the coast of Normandy, France, not far from Omaha Beach. As we toured this location, we saw the now empty craters which had housed a battery of guns fortifying the region. U.S. 2nd Ranger Battalion was given the task of destroying the strong-point early on D-Day . The Rangers successfully carried out their mission, scaling the steep cliffs and engaging with the enemy. We didn't have to stretch our imagination too far since our guide had a book containing pictures taken back in the 40s. 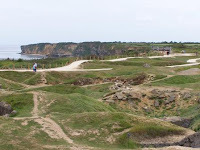 Check out our photo album for more pictures of Pointe du Hoc. The last images of Normandy that I'd like to leave you with are from our final stop before returning to our ship. Honfleur, France is a picturesque harbor town known for it's cobblestone streets, slate-covered buildings, painted many time by artists. The Sainte-Catherine church, which has a bell-tower separate from the principal building, is the largest church made out of wood in France. As we walked along the harbor streets, it began to rain harder. We had considered having something to eat in one of the cafes that lined the harbor, but the rain put a damper on things. We had had a full day exploring Normandy, and decided that these peaceful images of this town were a fitting way to end our tour. 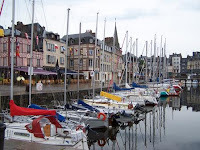 Check out more pictures of Honfleur in our photo album. We have been on many cruises in over 20 years. I'm often asked what is my favorite cruise. It is difficult for me to answer that question because each cruise has something special that I remember. Our visit to Normandy definitely ranks among my favorite destinations, especially due to the fact I could retrace history and begin to understand why my dad never spoke of the war. I highly encourage you to visit this special region, even if you aren't a history buff I think you will enjoy your visit. Until we meet again, happy cruising. On this day in June 2004, this Normandy beach was calm, as seen in the photo. Out of range of this photo is a child riding his bicycle along the path. 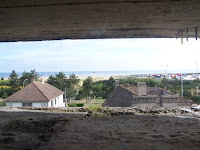 On June 6, 1944, this same beach was anything but calm as allied troops landed here. "On that chilled dawn, these beaches echoed with the sounds of staccato gunfire, the roar of aircraft, the thunder of bombardment. And through the wind and the waves came the soldiers, out of their landing craft and into the water, away from their youth and toward a savage place many of them would sadly never leave." Walking on this beach, I couldn't help but remember my dad and the struggles that he had endured on this very same beach 60 years ago. Fortunately, my dad had managed to leave this savage place, but it had left a mark on him forever. This is truly an experience that I will remember for the rest of my life. The guns are silent now, but they still remain as a remembrance of the past. Our guide took us to all the major Normandy beaches during our tour. He brought along photo albums containing pictures from 1944 which he shared with us in each location. 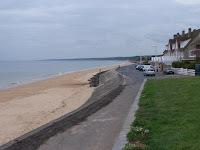 Take a look at my Normandy Beaches album for more photos during this portion of our tour. 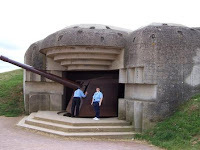 Not far from the Normandy beaches was another one of our stops, Le Grand Bunker Museum . 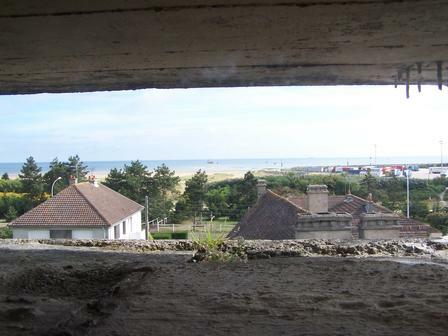 The view at the left is looking out from the bunker. From the outside of the building, you'd never expect to find many small rooms accessible via narrow passages. There were several rooms including a radio room, operating room, supply rooms, and of course the observation room from which machine gun fire and grenades rang out in June, 1944. Click for More Photos. We made a photo stop at Pegasus Bridge where there's a museum that tells the story of 6th (Airborne) Division on D-Day. There's also a cafe there. Click for More Pictures. In my next post, I'll take you to St. Mere Eglise, Point du Hoc, and Honfluer for the conclusion of our Normandy tour. On June 6, 1944 (D-Day) my father landed on Omaha Beach near Normandy, France. He rarely spoke about that day other than to say that he was in a tank which was sunk when they tried to land, he was rescued, and later redeployed. He and his wife went back to Normandy for the 40th Anniversary of D-Day. My husband and I had the opportunity to visit the area during our 12 Night British Isles / Norwegian Fjords Cruise on Royal Caribbean's Jewel of the Seas in June, 2004. That year marked the 60th Anniversary of D-Day. The ship docked in LeHavre, France. Two of the popular destinations that can be reached from that port are Paris and Normandy. Since we had visited Paris before, we decided to retrace history in Normandy and the surrounding countryside. Another couple joined us on our private tour. Our tour guide was very knowledgeable and actually had taken part in the event planning for the 60th Anniversary. Our guide picked us up at the ship and we began our day-long adventure. This trip brought to life what had up until this point only been passages in a history book. Our first stop was the British Cemetery (Bayeux War Cemetary). This is a well-kept cemetery with grave markers all lined up in rows. There is a main monument near the entrance which was lined with flowers (most likely left over from the recent anniversary ceremonies). Across from the cemetery was a farm where cows were grazing. If you weren't familiar with the area, you might have driven past the entrance without even noticing. We also stopped at the Normandy American Cemetary and Memorial. This cemetery is also well-kept. Once again, all the grave markers are in rows, but this time, they seem to go on forever. When you step onto the grounds you are no longer in France, but rather you are on American soil. All the soldiers resting there have a view of America. We spent some time walking around the grounds, visiting some of the more famous graves. It started to rain while we were there which seemed quite fitting. It was as if the heavens were crying. 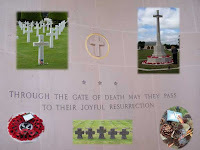 The final cemetery was the German Cemetery (La Cambe War Cemetary). Unlike the previous two cemeteries, this one has had periods of time where it was not well-kept. We learned that private funding had recently been obtained to do some improvements. There is a central monument that stands on a hill in the cemetary. Looking around the grounds, you'll see groups of small crosses (as you can see in the picture above). This cemetary seemed to be very dark and gloomy, despite the flowers and other decorations. These are just a few of the locations we visited that day. I'm including links to photo albums for the cemeteries. In my next post, I'll continue with some of the other locations we visited. The albums and other links can also be found on Our Cruise Vacations website - Fjords trip. I highly recommend a cruise that visits the British Isles and includes LeHavre and Normandy in particular. If possible, take the whole family so that history can come alive. As promised, I'll talk about some of the Palaces and Castles we've visited in past visits to London. One of the highlights of one London visit was the Changing of the Guard Ceremony at Buckingham Palace. During our visit it would have been possible to see the state rooms also, but we didn't want to wait in line for that. We had spent several hours there already. The ceremony was quite an experience. We were very glad that we had waited for it to begin. See the London photo album for more pictures. Buckingham Palace is a must see attraction if you've not been there before. 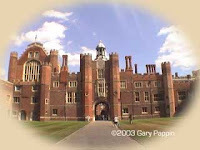 On another stay in London we planned a visit to Hampton Court Palace We took the tube to Richmond and then the R68 bus to the palace. Make sure you have a travelcard that is good in Zone 6. We returned by train. Allow sufficient time to visit all the King and Queens apartments, the state apartments, the tudor kitchen, and the palace grounds. You can tour on your own or follow the audio guides. For more pictures, see my photo album or the official website (link above). 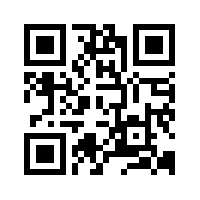 The website can help you plan your visit. Prior to our British Isles / Norwegian Fjords cruise, we spent two nights in London. 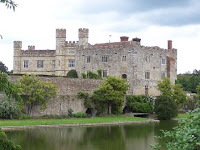 During that visit, we scheduled an all day tour via Evan Evans tours to Leeds Castle (pictured to the left), Canterbury Cathedral (pictured to the right), and Dover. Click here if you want to see some pictures of the White Cliffs of Dover. Here are some additional photo albums from this trip: Leeds Castle (Gardens), Leeds Castle (Part 2), and Canterbury Cathedral. Besides Leeds, we also spent a day at Windsor Castle (pictured to the left). It is possible to get there via Tube and Train. For more information about how to get there, prices, opening times, etc., see the Royal Collection website. 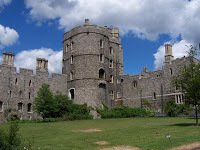 See my Windsor Photo Album for more pictures. These are just a few of the palaces and castles that you can easily visit during a one or two-day pre-cruise stay in London. Prior to your visit, it is advisable to check the official website to see if there are any closures or other items of interest during your visit. For example, state rooms in some palaces are only open during certain times of the year. We have taken many cruises that originated from one of the three ports near London, England: Dover, Harwich, or Southhampton. As I've mentioned in past posts, I like to arrive in our embarkation port at least one night before the cruise. In the case of European cruises, that increases to at least 2 nights. London has become one of my favorite cities in the world. It is so easy to get around due to the wonderful transportation system. You'll want to become familiar with the London Underground (the Tube) system since it makes exploring Central London, or even outlying areas of London, very inexpensive and possible. Your best bet is a visitor's Travelcard valid for all the regions you wish to visit for the duration of your stay. You can purchase a Travelcard in advance alone on in conjunction with the London Pass. If you plan on visiting several of the attractions featured in the London Pass, then it can become a good value. The big advantage of the London Pass is that you avoid the queues when you visit the featured attractions - which helps you make the most of your time. NOTE: I noticed that there was a sale featured on the website, so take advantage of this if you are traveling to London next year. Another way to get around Central London and the surrounding area is to use City Cruises hop on, hop off boat tours. On a recent trip to London, we went from Westminster Abbey to Greenwich, England via the boat tour. In this picture, we are passing the Tower of London, a must see attraction. 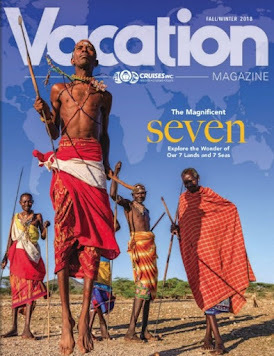 Click one of the above links or here for photo albums from our recent pre-cruise stay before our 14-Night Scandinavia/Russia (Baltic) Cruise on Celebrity Cruises Constellation as well as other cruises from London. TIP !! Speaking about hop on, hop off tours... that is a very cost effective way to see a port city. During our Baltic cruise, we used several tours (bus and boat) to explore the various ports. For a nominal charge (often around $20 or less) you can spend the entire day exploring at your leisure. Of course, you want to be mindful of the schedule so that you get back to the ship before departure time. While in London before our British Isles/Norwegian Fjords Cruise, we attended the Ceremony of the Keys, the traditional locking up of the Tower of London at night. If you are interested in this ceremony, you must write for tickets in advance of your trip. I'd love to share pictures with you of that ceremony, but that is not possible - it's a secret ceremony that can't be shared. I highly recommend this special experience if you've not done this before. Of course, don't forget to view the Crown Jewels while you are there. In my next post, I'll talk about some of the Palaces and Castles nearby London that we have visited on past pre-cruise stays. 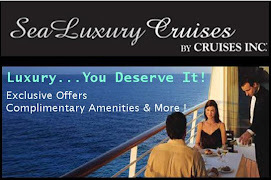 If you can't wait, you can view our Cruise Vacations website. Happy Thanksgiving! I hope that you, your family, and friends have plenty to be thankful for this holiday season. I know that I have plenty of things to be thankful for, including my health, family, and friends and the ability to share my love of cruising with all of you. I’m grateful that I’ve been able to explore new worlds with family and friends again this year. The highlight of the year was our cruise to the Arctic Circle / Northcape (Norway) where we got to see the magnificent fjords of Norway. While we’ve been to Norway before, crossing the Arctic Circle and stopping at Northcape (the northernmost point of Europe) were new for us. What a wonderful world that has been created for us to explore. As I started to write this article, I couldn’t help but think about the innovative and brave explorers who ventured into the unknown seas in search of a New World. Without those first ship-builders, captains, and crews, who passed their knowledge down from generation to generation, I suspect I wouldn’t be writing to you about our recent voyages. Another highlight of this year was a pre-inaugural cruise that I took on Royal Caribbean’s Liberty of the Seas, their newest and most magnificent ship yet. Those early pilgrims sailed the oceans in ships that were made of wood, not steel like those of today. They had no engines to speed them along, but instead had to rely on the wind to guide them to their unknown destinations. While on the Liberty OTS, I got a back-stage look at the ship’s bridge, with all the latest navigation technology. The early explorers had their sextants and crude charts which might have been enhanced by information from previous voyages. I’ve been on several Trans-Atlantic cruises over the years. Usually there are about 7 sea days as the ship crosses the Atlantic from the last port of call (depending on the itinerary). Contrast that with the 65 days it took for the Pilgrims to sail from Plymouth, England to the New World. I’ve often sat on my balcony, during one of those sea days, and let my mind wander. Once again, I’d find myself thinking back to those first voyagers and what they must have been thinking as all they saw was water around them. They put their trust in their captain to get them safely to their destination. Today, modern technology, along with the skills of the captain and crew, get passengers to their destinations in very comfortable accommodations. Those of you, who have been sailing in the past, join me in thanking those early voyagers whose knowledge helped form this transportation industry which we perhaps take for granted. I wish you all good health, so that you will be able to continue to travel around the world exploring new sights. In this post, I'll continue with some myths. There are some people in this world that suffer from motion sickness. A good friend of mine gets motion sickness in a car and on an airplane. That doesn’t mean that she never gets in a car (she does every day) nor take an airplane ride (she takes several trips each year). What it does mean, is that she takes preventive measures that help counteract the balance problems. 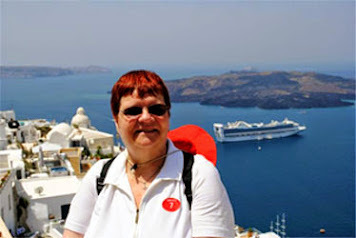 By the way, she has been on several cruises and once again took precautions and was able to enjoy the vacation. Modern ships are very stable thanks to the stabilizers which prevent side to side and up and down motion. Except in the roughest of seas, someone that is susceptible to motion sickness will be fine as long as they utilize one of the preventive measures that are available. Consult your doctor before your cruise if you have any concerns – they can make a recommendation for a remedy that will work for you. You can also check with guest relations onboard the ship should you start feeling the motion. I’ve been cruising for over 20 years and haven’t personally had motion sickness, even in the roughest seas. A secret that I’ve used is to be sure to drink plenty of water and eat regular meals. There’s been lots of press over recent years about Norwalk Virus. A ship isn’t the only place where this illness can strike, but cruise ships often make big news when the virus occurs. Cruise lines take as many precautions to prevent this disease as possible, the rest is up to the passengers. When you board the ship don’t be surprised if you are asked to complete a medical declaration. You’ll also find sanitizers (as shown in this picture) spread throughout the ship. On my most recent cruise, aboard NCL Pearl, the crew took this very seriously and had someone stationed by the gangway every time we boarded. Also, there were sanitizers by all dining venues and a crew member manning the door to make sure everyone used the sanitizer. The secret to avoiding this illness is to be sure to wash you hands often during the cruise. One thing to note – should you become ill, you need to report it to the doctor onboard. Failing to do so could put the whole ship at risk. Often people get upset that the doctor confined them to their quarters when they were sick, but the alternative would be to have hundreds or thousands of people sick. It’s no different than children passing various illnesses at school. A little prevention goes a long way. So, don’t worry about these possible problems ahead of time. Simply take the necessary preventive measures and odds are you will not have any problem. Granted food of all varieties is available onboard the ship, but that doesn’t mean you need to gain weight on your cruise any more than it would if you were at home. 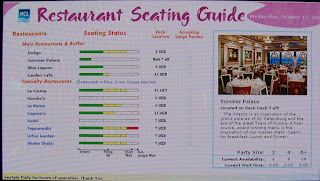 Cruise lines offer a variety of menu options and can also assist with special diets. If you have special dietary requirements, be sure to let your Cruise Specialist know when you book your cruise so that they can inform the cruise line. Even if you find yourself eating too much there are very simple measures you can take to combat gaining weight. A simple step I take is to use the stairs instead of the elevator as often as I can. When booking your cruise you may even consider location on the ship to optimize the chances of you using stairs or walking to get to public areas. If you want something more formal, than simply walking the stairs, there are several options including fully equipped gyms, jogging/ walking tracks, basketball courts, swimming pools, rock climbing walls, and various formal classes (such as aerobics). Of course, that’s just onboard the ship. You can plan your shore excursions so that you get some exercise doing one of your favorite activities. So as you can see, by eating sensibly and adding some exercise during your cruise, odds are you won’t gain weight. I’ve actually had several cruises where I’ve lost weight and believe me, it wasn’t from skipping meals. Your Cruise Specialist can recommend a ship that has the activities that you will enjoy and be more likely to participate for a healthy cruise. Too expensive as compared to what? Unless you are a hermit I’m sure you’ve noticed that the US dollar is not very strong in Europe at the moment. If you were to plan a land-based trip to Europe, I can easily bet you’d spend more than you will on a cruise visiting the same locations. There are several reasons why this is the case. First, if you book early, you lock in the price for your trip regardless of any price increases by the time you leave for your vacation. Secondly, your room and board, all meals, and lots of entertainment onboard the ship are included in the price of your cruise price. The money you save on meals alone will give you extra money to spend in ports on shopping or other activities. On a recent cruise to Norway earlier this year we had two BLT sandwiches and Cokes for approximately $50 US. That was our option and there were less expensive meals that we could have eaten. We had a choice in this case, but if you were on a land-based trip, you might not have options. With the value of the dollar declining, do you avoid going to Europe? I hope the answer is no because it is a wonderful place to go to experience your family roots, culture, history, scenery, etc. What better location to take your children, as they study world history, then to the site where history was made. I’ve traveled to many European destinations that I would never have seen if it had not been by ship. Here’s a secret: look at a Repositioning Cruise (sometimes called Trans-Atlantic) since these are often a very good value. To get the best value for your travel budget, I encourage you to work with your Cruise Specialist. We can provide you with advice that you can’t get from any internet price list. The biggest secret to saving money on your cruise vacation is to plan ahead and be flexible if possible. Prices can vary from week to week even on the same cruise. If money is a concern, a little homework will go a long way. I’ve covered a few of the more popular myths that I’ve heard over the years. This is not an exhaustive list. If you have others that you’ve heard and would like me to comment, either comment here or contact me via email and I’ll be happy to do so. As Royal Caribbean Cruise Line says "Get Out There". Current statistics shows that only 15% of the population has taken a cruise before. Of those that have cruised, 90% cruise again. I suspect that some of the myths and misconceptions may be influencing people that have never tried cruising before. In this post I’ll take a look at some of the more popular myths and misconceptions. The destination and cruise line, among other things, contribute to the demographics of your fellow cruisers. Several factors influence the passenger mix on a given voyage. Most passengers on a world cruise will be senior citizens, since there aren’t many younger people that are able to get away from work for three months or more. Certain destinations, such as Polynesia and the Bahamas, may have a number of newly wed couples onboard. The Caribbean will most likely have the largest demographic mixture, although the time of year may also influence the mix of passengers. When school is in session, there will be far less children onboard than during summer vacation for example. Historically, certain cruise lines have catered to a particular age segment. For the most part, that is changing since the industry is seeing an increase in families (consisting of multiple generations) traveling together. 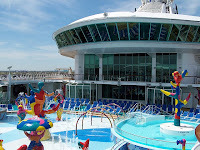 The major cruise lines have added children’s programs, spa and fitness programs, internet cafes, sports and recreational facilities, and other amenities which appeal to all age groups. This doesn’t cover all the possibilities, but I hope you get the idea that regardless of your age requirements, there is a cruise out there that will satisfy your needs. I strongly encourage you to work with a Cruise Specialist who can help you select the cruise that is right for you and your companions. When you arrive at your cabin after embarking the vessel, you’ll find the daily program of ship’s activities. Every day, your cabin steward will provide you with the program for the next day in addition to any other important information (such as reminders about time changes, invites to special events, etc). While many people, that haven’t cruised before, feel they will be bored, a quick examination of the daily program will reveal that there are many activity choices that you can make each day. The great news is you can be as active or inactive as you want both onboard the ship and in ports that are visited during the cruise. The ship has an entire staff devoted to activities and entertainment. There should be no reason to be bored during your cruise. I would highly encourage you to discuss your interests with your Cruise Specialist while planning your cruise vacation. While you’ll find many of the same amenities and activities on most ships, there are certain ships that have added some unique features that might be of interest to you. Spa / Fitness Center (workout, have a massage, relax, take a course), swim or relax in one of the pools / hot tubs, jog or walk around the jogging track, play your favorite sport (basketball, table tennis, golf, miniature golf, etc). Some ships even have rock climbing, ice skating, bowling, and even billiards on self-leveling tables. Relax - curl up with a good book (in your cabin, in the library, poolside, or any quiet spot) or simply find an empty lounge chair on one of the decks. Attend a talk or learn a new skill (destination talks, computer skills, learn to dance, scrapbooking or other arts & crafts). Attend an art auction, wine-tasting or other scheduled events. The shore excursion desk can help you plan enrichment and other activities for your ports of call. Spend some time surfing the net in the internet cafe (or on many ships from your own PC). Shops onboard are duty free just like they are in ports of call. Typically there will be daily specials throughout the cruise, so you'll want to check your daily program to avoid missing your favorite items. These items, if taken home, will count towards your customs allowances, so be sure to keep that in mind while shopping. There usually are shopping talks and/or shopping guides so you can plan your port shopping trips. 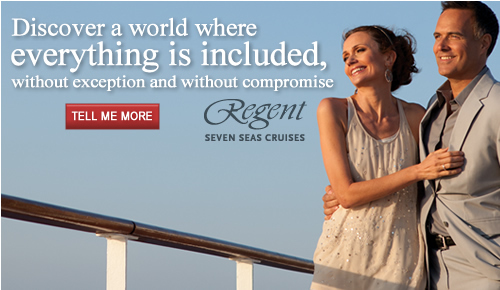 THEME CRUISES -- another possibility, if the only thing that keeps your interest is some specialty or theme. Theme cruises are very popular these days. I have helped clients find a theme cruise that interested them. It's also possible to start your own group with others that share your interests. Besides, there are benefits for traveling in your own affinity group. NEXT TIME: we'll look at a few more myths. Also, email me if there's a topic that you'd like me to discuss. I'd like to make this blog a vehicle for sharing ideas and helping you enjoy cruising more. We've just changed our clocks back an hour for the end of Daylight Savings time. My mind has wandered back more than an hour, and I've found myself in a time before my first cruise. I had never even considered a cruise when I went with a friend to a local travel show. 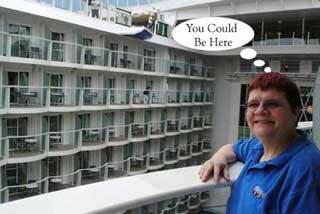 As a lark, I entered a contest, one of the vendors had, for a free cruise. Little did I know, filling out that raffle ticket would turn out to be the beginning of a still-thriving 23-year love affair with cruising. 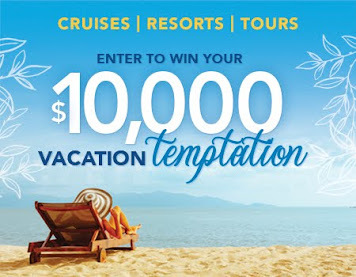 If you haven't guessed, I was one of the winners of a cruise for two. All we had to do was make our own way to Florida. My husband and I didn't know what to expect as we headed down to Florida for the optional stow-away night that we purchased for an extra $25. We had decided to spend the extra night onboard so that we didn't have to worry about missing the sailing (something that we still do to this day - except now we stay at a local hotel). The ship we went on was the Yankee Trader, a Windjammer ship. This wasn't the typical cruise ship that you see in commercials. It's a small yacht that held about 100 guests and crew. The dress code was swimsuit and barefeet most of the time (except for the Captain's dinner where we had to put on our shoes). If you wanted to help with the sails, you could do so, but weren't required to participate at all. Fun and relaxation were the only requirements of this first cruise of ours. To this day, we can still remember all the new friends we met, the great crew, the rum swizzles, the pig roast for the Captain's dinner (complete with apple in the mouth), the fresh grouper dinner one night (using fish we caught off the bow), the toga party (my husband came in second place), the beautiful wood that graced this small ship, the wonder of being immersed in nature - the sea and beautiful islands. We had to pinch ourselves to make sure this wasn't a dream. Our second cruise was quite different than the Windjammer. My same friend had booked an outside cabin on Carnival Celebration for a Spring Break get-away. They had asked us to join them, but we already had a vacation planned at Christmas, and didn't think we'd be able to go again in the spring. After our land-based vacation in December, we decided that we needed a "vacation from our vacation", and upon return booked the cabin next to our friends. This ship was quite different from our first experience. The Celebration was a 37,000 ton floating resort (It's since been refurbished and is now over 47,000 tons). By today's standards, it was quite small, but when you compare it to the Yankee Trader, you can just imagine how we felt when we got onboard. The first thing we saw when we got onboard was the Pursers Lobby, which was just like walking into the lobby of any of the finest hotels we'd ever stayed in before. From there we were directed to our stateroom, our home away from home for the next seven days. Our particular outside cabin had a picture window (some outside cabins have port holes). For those that have never been on a ship, you can compare an outside cabin to a hotel accomodation where you have an ocean view but the window doesn't open. In the case of a ship, the type of window varies by ship and location on the ship. After dropping off our carry-on bags we looked through the daily guide that was on our bed, headed up to get something to eat, and then started to explore the rest of the ship. When we returned to our cabin, we unpacked our luggage which had arrived while we were exploring and got ready for the mandatory life-boat drill. What's this - a life-boat drill?? Can the ship sink? Am I in danger? What's up with this? Not to worry - this is standard on all vessels afloat. Just as you do when you get on an airplane, it's important for every passenger to be aware of what to do in the unlikely event of an emergency. I'm happy to report that cruise lines take safety very seriously - in fact, it's their number one concern. Once the drill is over, it's back to the main agenda - having FUN. After all, we were on one of the "Fun Ships" of Carnival Cruise Line. Well folks, that's all for now. I'm waving from one of the public decks as we sail away from our embarkation port. Don't worry, I'll be back to complete the story. In the meantime, if you can't wait, send me an email or give me a call. 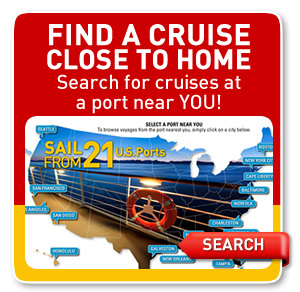 I love to talk to first-time cruisers and help them plan their first cruise vacation. I even love to talk to veteran cruisers, but that's a story for another time. Next time I'll take a look at some of the myths about cruising. Until then, happy cruising.